The 150th anniversary of William “Billy” Barker’s earth-shattering placer gold strike on Williams Creek in August 1862 was officially commemorated on Sunday, August 12th at the living history museum in British Columbia’s central interior that still bears his name. Barkerville, a boomtown named for the intrepid English prospector from March, Cambridgeshire who proved a legion of sceptics wrong when he struck it rich below Blackjack Canyon south of Richfield, was declared a National Historic Site of Canada in 1923, and later a Provincial Heritage Site in 1958. Since then, the uniquely-preserved historic town has become the largest heritage attraction in Western North America, complete with 135 restored or recreated wooden structures, 185,000 authentic artefacts, 18 old-fashioned businesses and scores of costumed historical interpreters. Barkerville hosts an average of 65,000 international visitors annually, and continues to be a significant cultural and economic force in the Cariboo region of British Columbia, much as it was in the days of Billy Barker’s legendary feat 150 years ago. “Discovery Day,” which capped off a weekend of sesquicentennial-themed activities at Barkerville Historic Town (including the triumphant return of the Canadian National Gold Panning Championships, hosted by Barkerville’s own 6-time World Invitational Gold Panning Champion, Scott Rea) was made possible in large part by Williams Creek Gold Limited, a local resource company. “Williams Creek Gold is pleased to be able to support Barkerville and is specially pleased to sponsor the Discovery Day celebrations,” said Williams Creek Chairman & CEO Michael R. Sonnenreich. “Barkerville played an important role in British Columbia’s early history and continues that legacy today with its interactive renditions that help bring the past into the present. 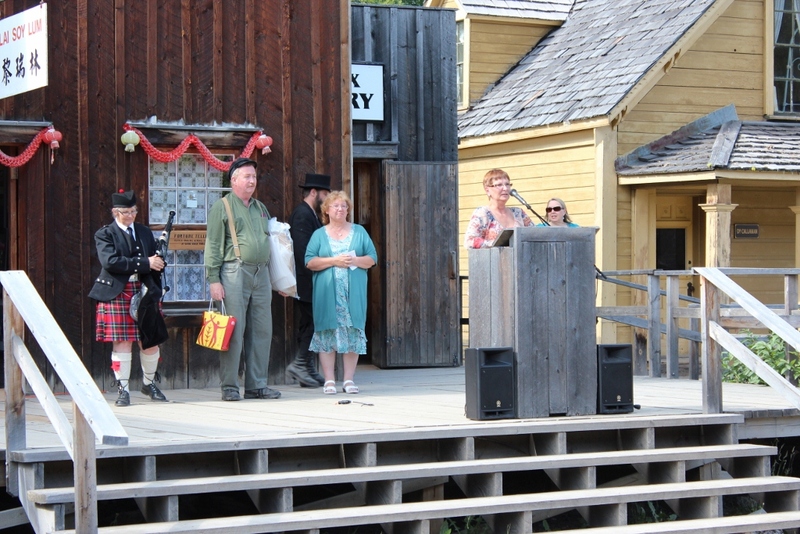 In addition to day two of the 2012 Canadian National Gold Panning Championships, Barkerville’s Discovery Day celebrations included a variety of musical acts, a Chinese magic show, a presentation of Andrew Hamilton’s new “Billy Barker” historical interpretation, and special visits from Barker’s great-great-granddaughter, Elaine Edgington, and the Consul General of the People’s Republic of China in Vancouver, Liu Fei. For more information about Barkerville’s Discovery Day celebrations, or any of Barkerville’s 150th anniversary events, please visit www.barkerville.ca/special_events.htm.